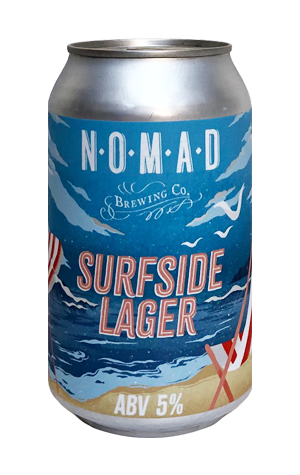 If you were asked to pick a defining thread that runs through the brewing history of Nomad, you'd likely plump for their fondness for showcasing native ingredients. Or maybe you'd go for their love of collaborating. Certainly, while they've released a few pale ales of a more line and length nature over the years, you wouldn't describe it as a line and length brewery. Yet, what do we have here, but a lager featuring the sort of hop profile you'd expect in a traditional European offering and a dash of maize as found in many a Central and South American lager. As the name hints, it's a beer designed as an accompaniment to the main event rather than one intended to be the main event itself: simple, malt-driven, with some soft floral hop character, low bitterness and a little residual sweetness. A surfside quaffer, in other words.